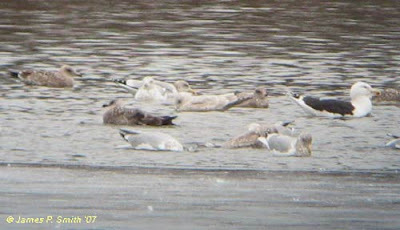 Possible Thayer's Gull Cape Ann, MA - December 30th. "P10 rarely has small diffuse mirror". 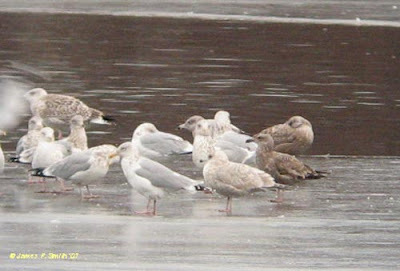 [Update: January 3rd] Further reading of Howell and Dunn (Gulls of the Americas) describes second cycle Kumlien's Iceland Gull as "sometimes (showing) a faint P10 mirror" and even second cycle American Herring Gull - "very rarely, a small, diffuse, P10 mirror". 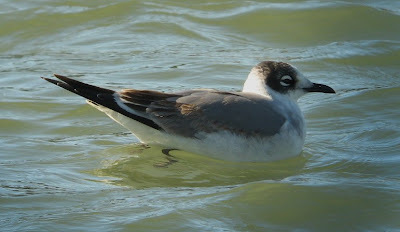 The latter, especially came as a bit of a surprise but clearly we can't place too much emphasis on the presence of a small mirror on P10 for this bird. 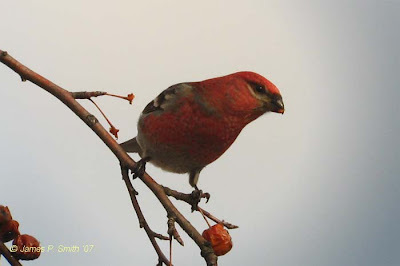 From British Columbia by Michael G. Sheperd. Found late in the afternoon after a fairly intense day of gull watching around Gloucester and Eastern Point, this second-cycle gull showed a number of characters that prompted me to start thinking about Thayer's Gull. 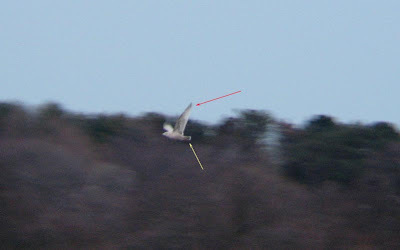 Watched at range with Scott Surner on Niles Pond in fading light. 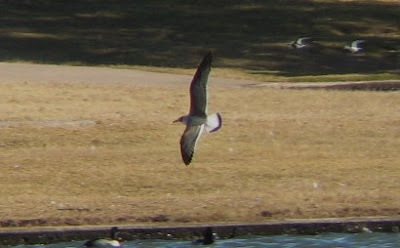 Conditions were far from ideal for digiscoping. 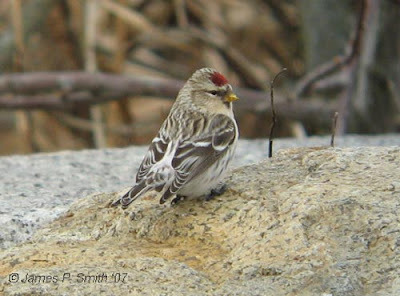 However, this image set should at least illustrate the bird that we observed and some of the reasoning behind the suggested identification of Thayer's. 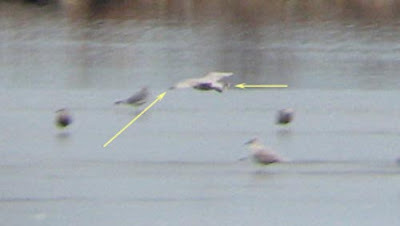 (possible 2nd cycle Thayer's lower right with American Herring Gulls). 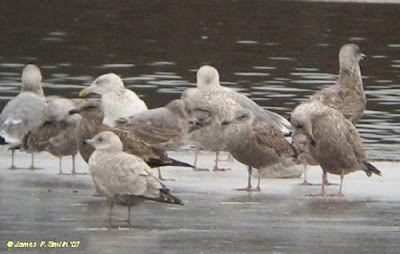 (possible 2nd cycle Thayer's in foreground with American Herring Gulls). 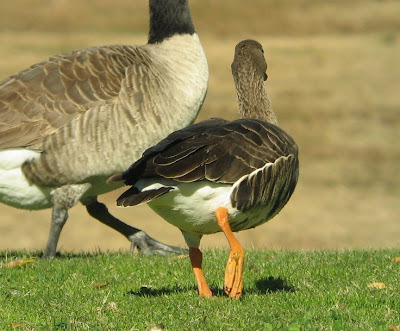 Contrastingly dark primaries showing pale whitish tips. 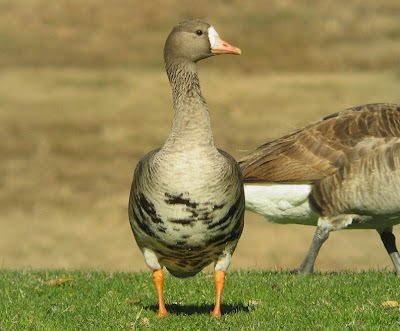 rounded head shape and shorter bill. 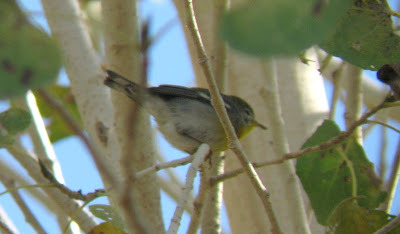 This bird showed a strikingly bicolored bill. Dark primaries not always obvious, with the bird at rest appearing Kumlien's like at times. 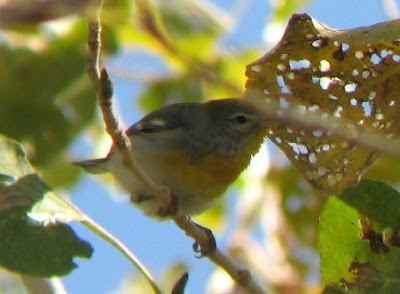 with prominent pale tips. Tertial centers are much lighter than primaries. 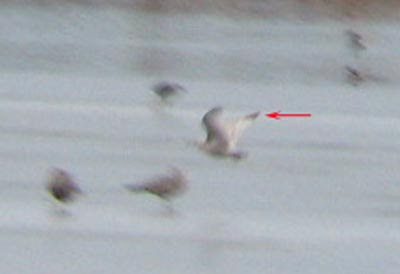 and 1st cycle Kumlien's Iceland Gull, right). dark outer primaries but translucent on rest of primaries). Detail of same image below. 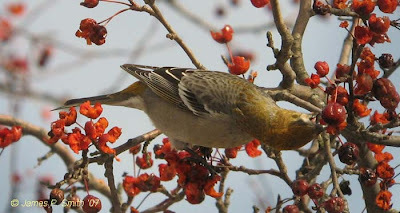 of the primaries than shown in this shot but observed well in the field. Distinctly dark brown outer primaries on upperwing. dark brown outer primaries but with rest of primaries pale). 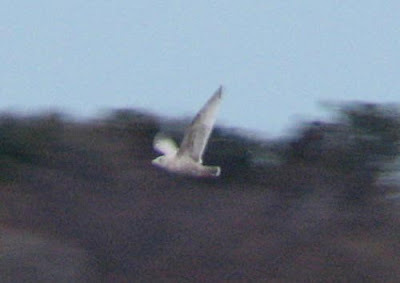 Passing over young Kumlien's Iceland Gull. 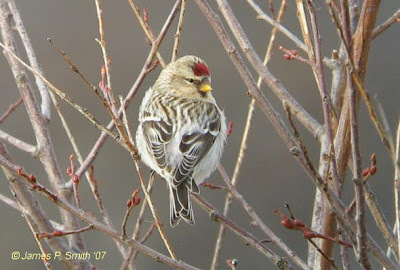 This bird was also seen and reported at Niles Pond on December 31st, 2007. Hopefully further observations will facilitate more thorough documentation. 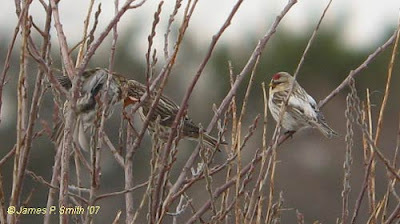 Hoary Redpoll (left) with Common Redpoll. 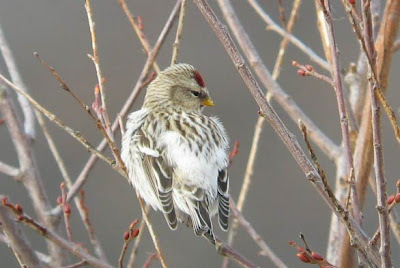 Hoary Redpoll - the darker of two individuals present. 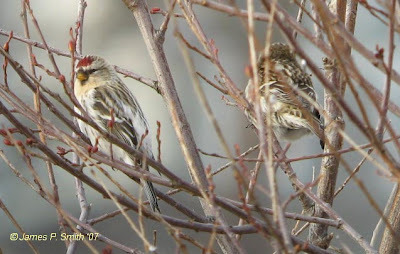 Hoary Redpoll - right of two Common Redpolls. 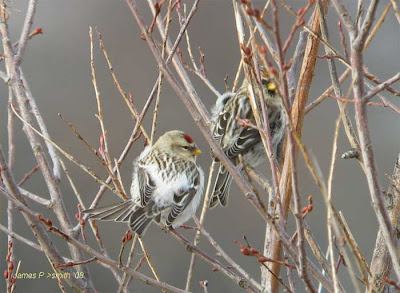 Hoary Redpoll - the highest bird in this group of Common Redpolls. 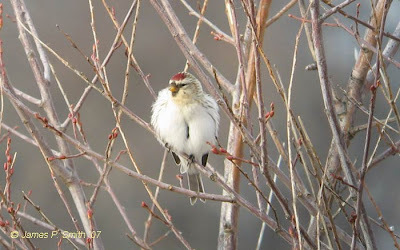 Common Redpoll - fairly large bird with obscured Hoary Redpoll rear left. Scott Surner and I drove from Amherst to spend most of the day at Cape Ann primarily focused on finding the previously reported Slaty-backed Gull. 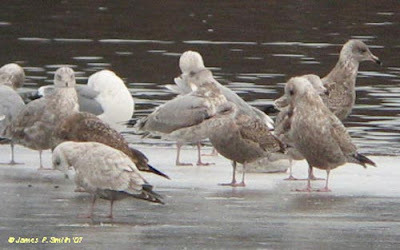 After a short visit to Inner Gloucester Harbor we spent nearly all our time at Niles Pond on Eastern Point checking through the gulls. 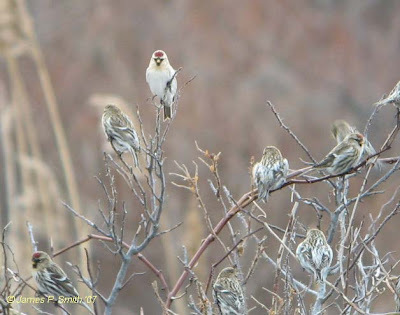 In the middle of the afternoon we a detected a small redpoll flock feeding on the dike between Niles Pond and Brace Cove and found a Hoary Redpoll immediately. The flock was somewhat skittish choosing to feed in a spot where they received much disturbance (dog walkers etc). 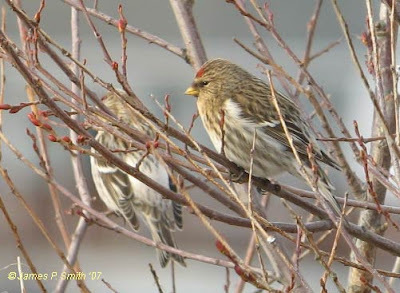 However, patience rewarded us (along with Phil Brown and many other birders) with good views of at least two Hoary Redpolls and about 25 Common Redpolls. Very sweet indeed! NB. 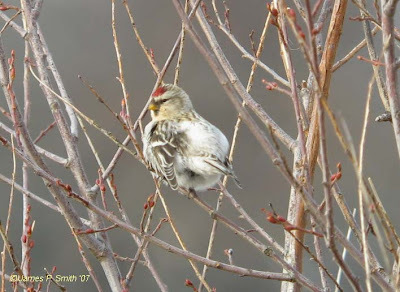 I have more Hoary Redpoll references from the 2003/04 influx into New Hampshire on my website. 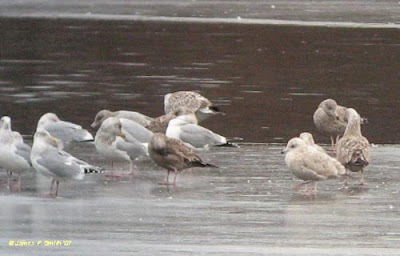 Although the Slaty-backed never materialized, we enjoyed some superb gull watching logging c.20 Kumlien's Iceland, 5+ Glaucous, 2 Lesser Black-backed and 2 Bonaparte's Gulls, as well as what may well turn out to be a second-cycle Thayer's Gull found at Niles Pond late in the afternoon. These along with a Dovekie in the Inner Harbor, Black Guillemot, the regular wintering Eared Grebe, Purple Sandpipers and a host of seaducks wrapped up a really excellent day on the East Coast. 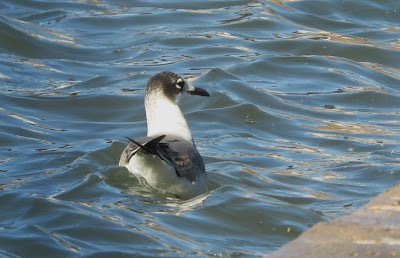 I'll make a separate post about the gulls, including the Thayer's, soon. 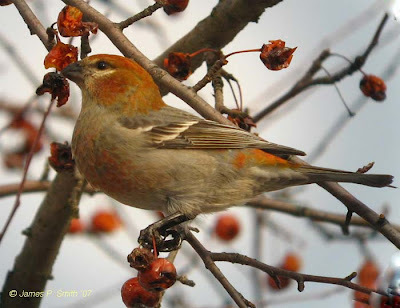 Pine Grosbeaks near home, Hampshire Co., MA - December 28th, 2007. Back in the Pioneer Valley! 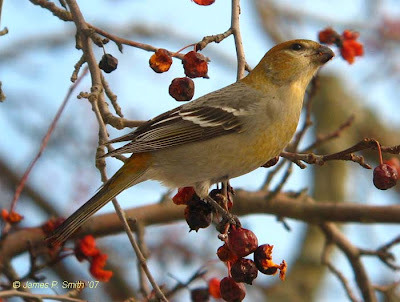 I could hardly resist the twenty minute drive east to Quabbin Park (actually Quabbin HQ) to try for these recently posted Pine Grosbeaks. 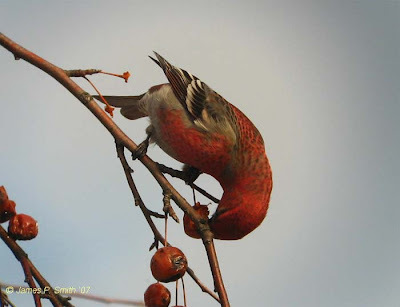 The birds came and went throughout the ninety minutes that I spent at the site but eventually settled to give wonderful views - all this despite lots of human traffic under the crab apple trees in which they fed. All I can say is....... 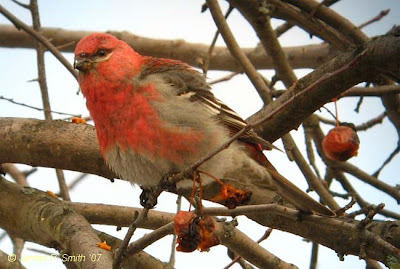 I just felt privileged to have these beautiful boreal visitors up so close as I've never seen them before. 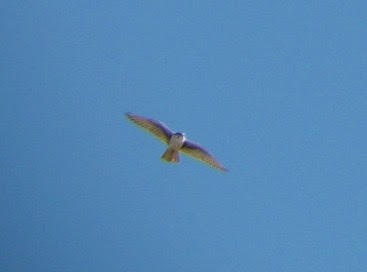 A complete range of plumages too, though of the thirty birds present, only three were adult males. After another morning of point counts I headed back to Fountain Hills via Scottsdale Road, calling in at Back Lake, McCormick Ranch. 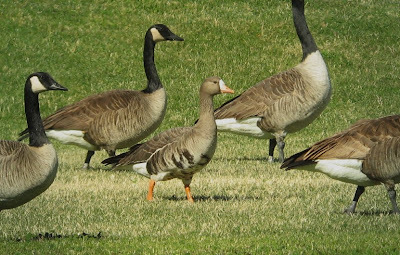 I was pleased to find good numbers (100+) of Canada Geese there, though no Cacklers that I could see. 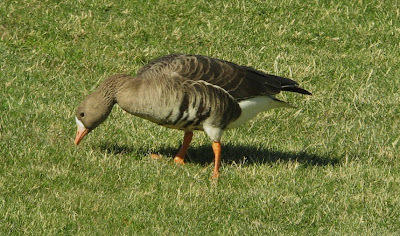 A really nice surprise was a White-fronted Goose grazing right next to the main road. 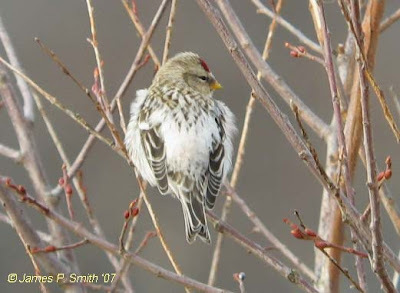 It looked small and relatively pale, with a more pinkish bill compared to the birds that I've seen in recent years in the north-east, such as this bird near home in Amherst, MA. 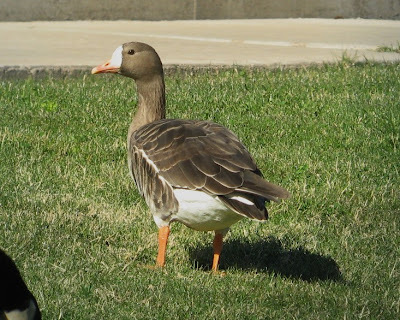 I'm wondering about Russian White-fronted Goose but would like to do a little more reading on the subject first. 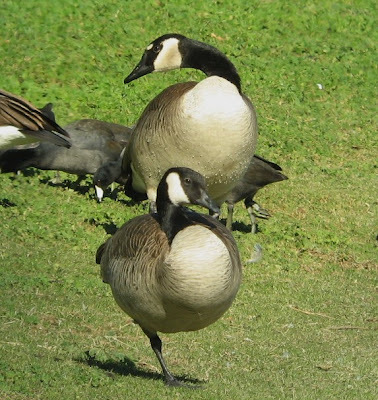 Also of interest, a good candidate for 'Giant' Canada Goose (B.c. 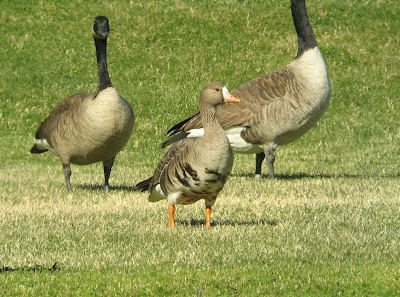 maxima) amongst the 'presumed' Moffit's Canada Geese (B.c. moffiti). 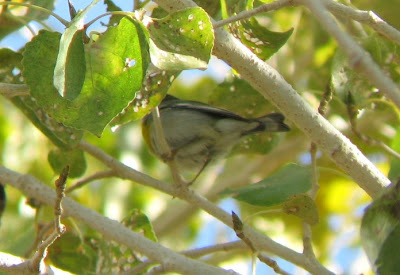 Features associated with maxima include the very large size, large bill, broad white cheek extending high towards the crown and prominent white spots on the forehead. 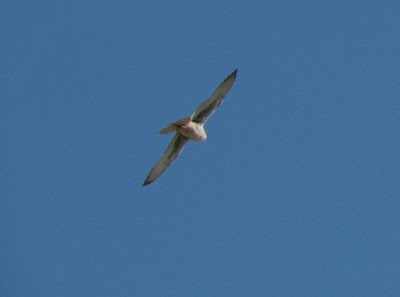 About four Northern Rough-winged Swallows were quartering over the water as well. 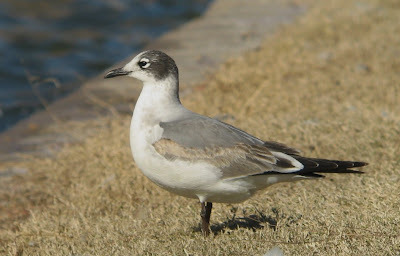 After the morning's point counts I called in at Kiwanis Community Park lake, deep in Tempe, to try and locate the Franklin's Gull found by Pierre Deviche a few days earlier. 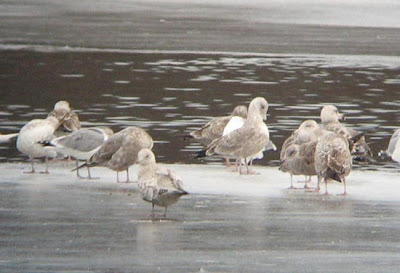 There it was, the only gull present loafing with American Coots, Lesser Scaup and Ring-necked Ducks! 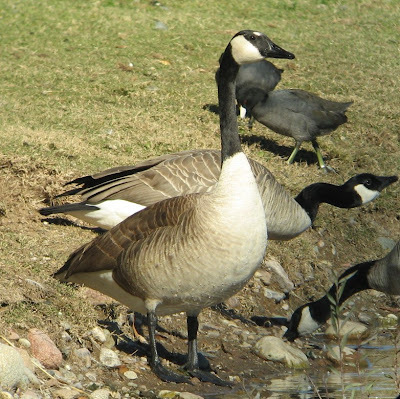 The bird is already well adapted to its urban surroundings, freely scavenging bread from folks feeding the ducks and coots. 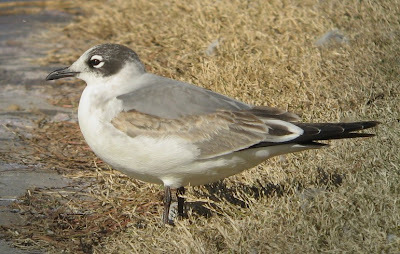 Franklin's is still one of my favorite gulls and these could be the best views I've had of a first-winter bird. Another nice surprise for the urban setting was a Prairie Falcon which appeared briefly, 'buzzing' the coots and ducks grazing on the lawns. 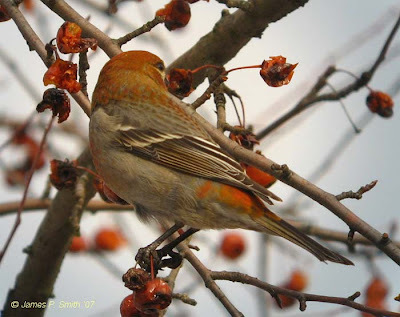 Digibin images taken using Leica 8 x 42 binoculars with Canon Powershot A540 compact digital. Red-tails(including dark-morphs)in that area for comparison. the field. All of these are digibin images. Cattle Egret - 3 with cattle at intersection of Riggs/Ellesworth Roads. a parking spot to get some shots. on McQueen Street. 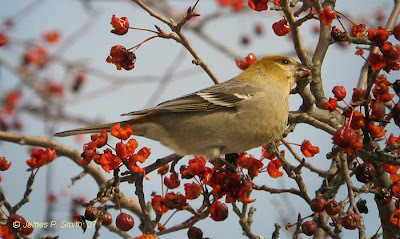 I think scarce in mid-winter. 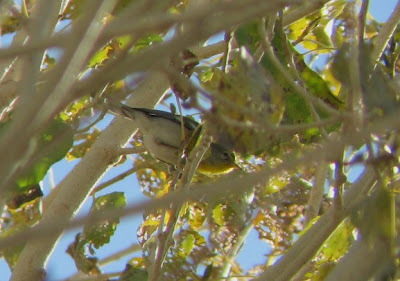 Northern Parula - A known bird discovered a week or so ago. be worth keeping an eye open for.